Many species in Britain today are not native, and a small minority of these pose a real problem to human health, the environment and the economy. These problem animals and plants are known non-native invasive species. An invasive non-native species is one that has the ability to successfully spread and colonise outside of its native range, often outcompeting native species and causing damage to the environment. Thames21 works to manage some of the common alien species which cause a problem to London’s waterways, crowding native species, reducing light and oxygen flow to water. Himalayan Balsam: Himalayan Balsam is a problem plant, which has spread throughout Britain, first introduced from India in 1855 for its attractive pink flowers. 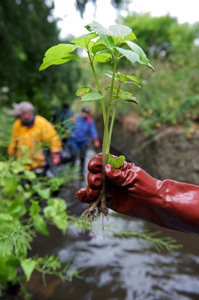 It spread from gardens and quickly started to grow along our riverbanks, where it can cause riverbank erosion, out-compete native species, and impact negatively on the wildlife in the area.Thames21 works with volunteers to remove this plant from areas it has colonised. Fortunately, physically removing balsam is quite an easy, if time consuming activity, and we find people of all ages and abilities can take part and have a lot of fun in the process. Each year we help lead the 3RiversCleanUp, a series of intensive events to tackle the species in South East London’s waterways. For more information on Himalayan Balsam click here. 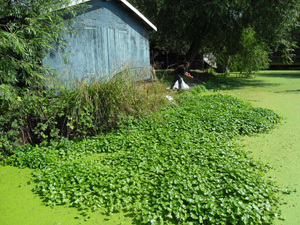 Floating Pennywort: Floating Pennywort is quite an attractive green weed that grows across water courses. It became naturalised in 1990 after spreading from ornamental garden ponds. It grows incredibly quickly, at a rate of up to 20cm per day, forming a carpet over the water, blocking out sunlight and outcompeting native species. It thrives in polluted water due to increased levels of phosphates, and as a result is a particular problem in the polluted waterways of East London. This weed can also be safely removed with volunteers. For more information on this weed, click here. Giant Hogweed: Giant hogweed is a large, seeding plant, which was introduced as an ornamental plant and has become common across England mostly due to deliberate planting. Its seeds can be spread by wind or watercourses, and as a result is seen along rivers and canals. Giant Hogweed is difficult to manage due to its highly poisonous sap, and even minor contact with human skin can cause welting and blisters. 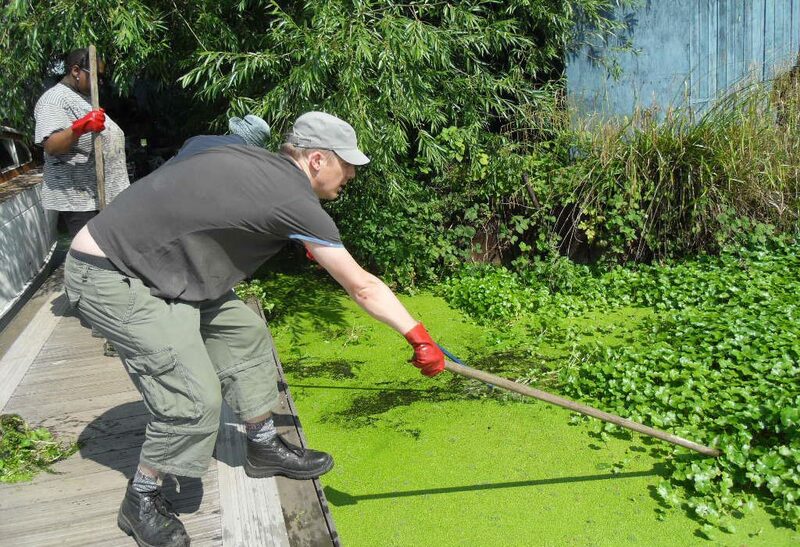 Thames21 staff have been trained in Giant Hogweed removal and can lead volunteers to do this safely, but it should not be attempted unsupervised. 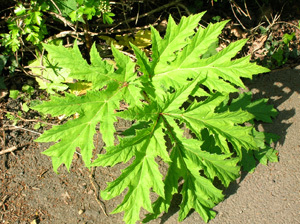 For more information on this weed click here. Japanese Knotweed: Japanese knotweed was also introduced to Britain as an ornamental plant. It is green in colour, has shovel shaped leaves. The stem is bamboo like in appearance produces white flowers around September or October. The plant spreads via a rhizome (underground stem) and stem segments, rather than its seeds. The weed can grow a metre in a month and can grow through concrete and tarmac, damaging buildings and roads. 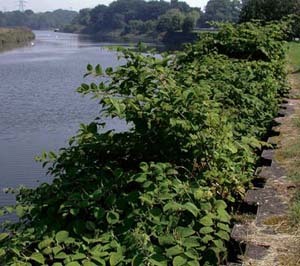 Thames21 staff have training in the use of pesticides and will treat small patches of Knotweed but removing or deposing of it incorrectly can cause the plant to spread and can be illegal so volunteers should only tackle this plant under supervision. Thames21 encourages people to spot and report non-native invasive species and helps train people in identifying them. We are part of a network of environmental groups and bodies, which helps manage and develop solutions to non-native invasive species in London. We will update you as our work in this area grows.